Ballet is the main genre of dance at our school and we have been fully registered teachers with the British Ballet Organization since the school was opened in the 1950’s. All our pupils take yearly exams in ballet and we pride ourselves in gaining a 100% pass rate over many years. 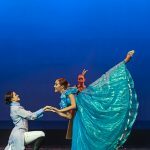 Some of our pupils have gained ballet scholarships with the British Ballet Organization and many have progressed to vocational level and have made a career from their training with us. As teachers we feel that ballet gives every pupil a solid foundation for all other types of dance and the ballet discipline improves many aspects of performance such as confidence, posture and listening skills. Ballet is a wonderful exercise for many and is a great way to make special friends along the way.